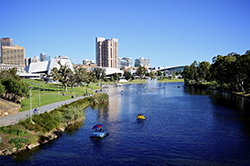 Our next Adelaide branch event is on the 8th of December at 12:00 to 18:00, held at the Adelaide PwC offices. This is our second of two half-day security conferences this year. We have great speakers lined up. Our May conference was at full capacity, so make sure you register now to ensure you get a seat. If you have a colleague that you would like to expose more to information security or what AISA Adelaide is all about, let us know at adelaide@aisa.org.au and we will do our best to find them a spot too.